California. 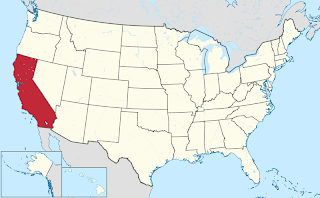 The third largest by land, and most populous of the states. Also, it has the largest economy in the US, accounting for 13% of the US. also, if California where an independent nation, it would rank 8th in the world on its own. The fist Spanish explorers popped up in California in 1533, and later in the 1540's via the Pacific. 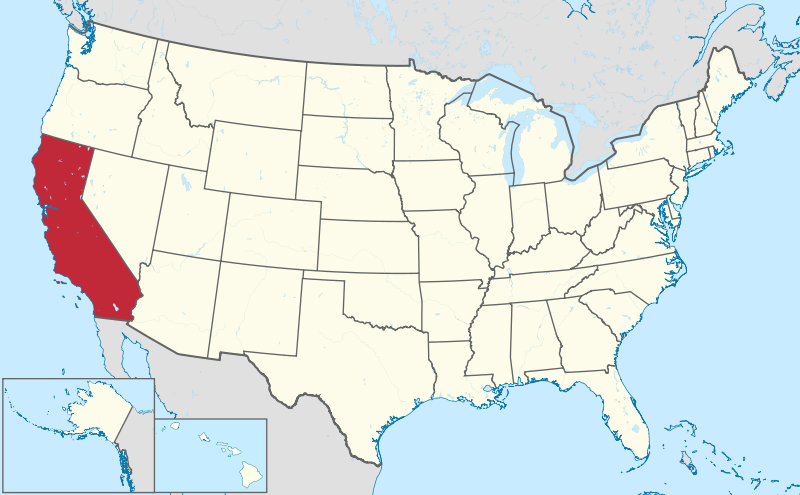 The whole of northern Mexico into what is today the US state of California where combined as one large territory. However, the area that makes up todays California did not see any large immigration from new settlers. Indeed, due to California being ringed by its own natural barriers (Mountains on 2 sides, deserts, and the Pacific) the Indian tribes developed quite differently to those outside! There was no huge wave of immigration because the only reliable way to enter was via ship. Unfortunately, that meant sailing from Mexico against the powerful California Current. Which made a journey into an easy 30 -40 day trip. In 1821, Mexico gained its independence from Spain, and took control of California. However, due to its isolation and low population, California did not contribute tax to the new and unstable Empire. Also, with the lack of control, the Californios engaged in illegal trade after they had begun to develop a growing tallow and hide industry. However, soon, Mexico scrapped anti-trade laws, and trade rapidly increased. 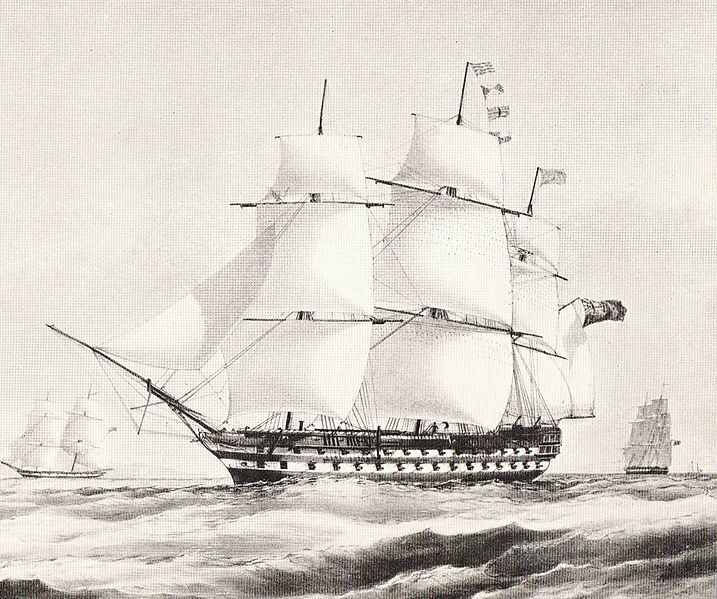 Trade soon reached about a ship a day from Britain and Russia as well as the US. The main port was the city of Monterey, where the paperwork and taxation issues where taken care of. During the late 1820's, more settlers began to arrive from all over the US and Canada after various trails into California across the mountains had been opened up. 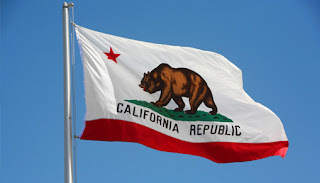 Due to bad mismanagement from Mexico, as well as about 40 different governments in just over 20 years, the new wave of immigrants rose up in revolt, and declared the new California Republic. 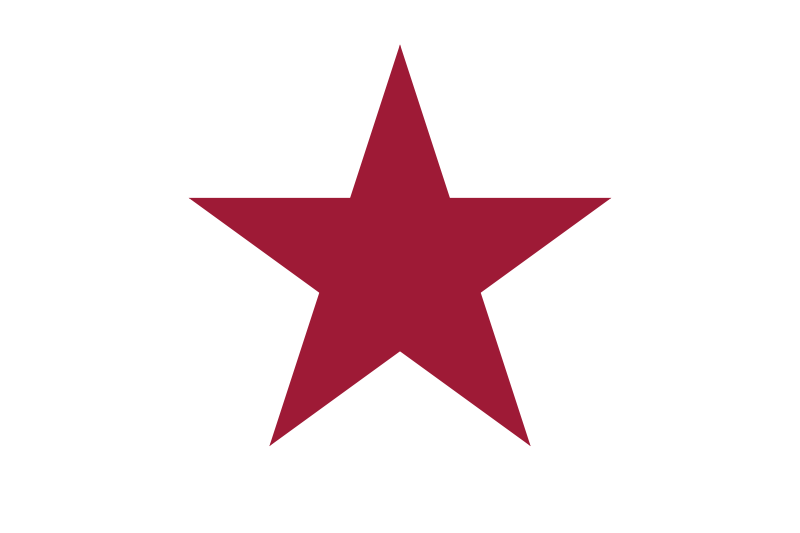 The revolt took place in 1846, with the capture of the Mexican governor, and the raising of the Bear Flag. 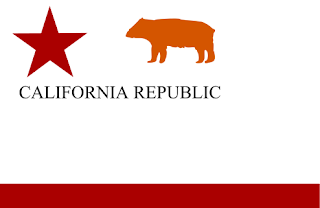 The Bear Flag was a white banner with a red bar on the bottom. It also featured a gold star and a bear, as well as the wording "California Republic" across the centre. All elements that where later incorporated into the California State flag. The revolt lasted just over 20 days, and really did not impact the rest of the state, and came to an end when, in the opening stages of the Mexican-American War, the US marched into California, and took control on behalf of the US. Initially, the US stationed Naval units along the coast as a guard against Mexico, but otherwise took no action to seize control. 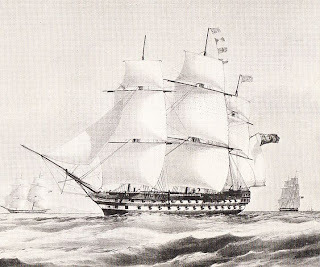 However, Commodore Sloat was spurred into action with the Bear Flag Revolt, and the arrival of the HMS Sir Collingwood, a massive 80 gun Royal Navy ship of the line. The US Marines took control without a shot being fired. 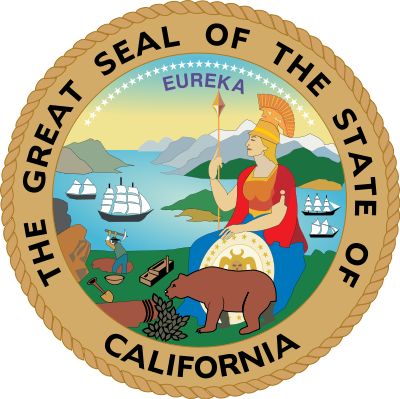 From 1847, to 1850 the US Military took control of California. A position it did not want as it had no training with forming a government! So, in 1849, a Constitutional Convention was set up after a vote had taken place to elect representatives. It was hardly truly representative, since no true accurate census had been taken up to that point. Admittance to the Union as the 31st state occurred in 1850, but it was not a straight run thing. With the Mexican - American War, conflict arose in the US senate between the slave states (across the south of the US) and the free states (across the north). As the US had success in the war, problems arose when trying to decide how to organize the territories. The southern slave states wanted slavery to be allowed, whilst the northern states wanted any new territories to be "free." With statehood came a population explosion. This was driven by the California Goldrush, with the discovery of gold in large quantities across the state. Population growth accelerated further in 1869 once California was connected to the rest of the US with the Transcontinental Railroad allowing easier access. Also, demand for food drove growth. It was discovered that the lands of California proved very fertile and if irrigated, would provide crops all year round. At the Constitutional Convention, it was decided to adopt a seal for the new state. The seal has remained in use since its adoption with minor alterations. The seal features the Goddess Minerva, the goddess of wisdom and war. It also features a grizzly bear. The state animal. The bear is eating a vine of grapes, which represent wine production. A sheaf of wheat represents agriculture, whilst a miner represents the Gold rush. The ships represent the the states economic power. The word "Eureka" is the state motto, meaning "I have found it!" The flag itself was signed in in 1911, and inspired by the Bear Flag from the California republic. It features a red star, which was taken from the "Lone Star Flag" which was raised in 1836, after a revolt by Juan Alvarado, and Isaac Graham tried to gain independence from Mexico. It failed. Also on the California flag is a wide red bar at the bottom, and a bear walking on grass, facing towards the star. The bear itself is the state animal, and modelled after Monarch, a bear captured in 1889. It was the last wild Grizzly in captivity. 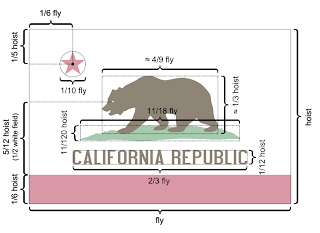 Underneath the bear is the text "California Republic." 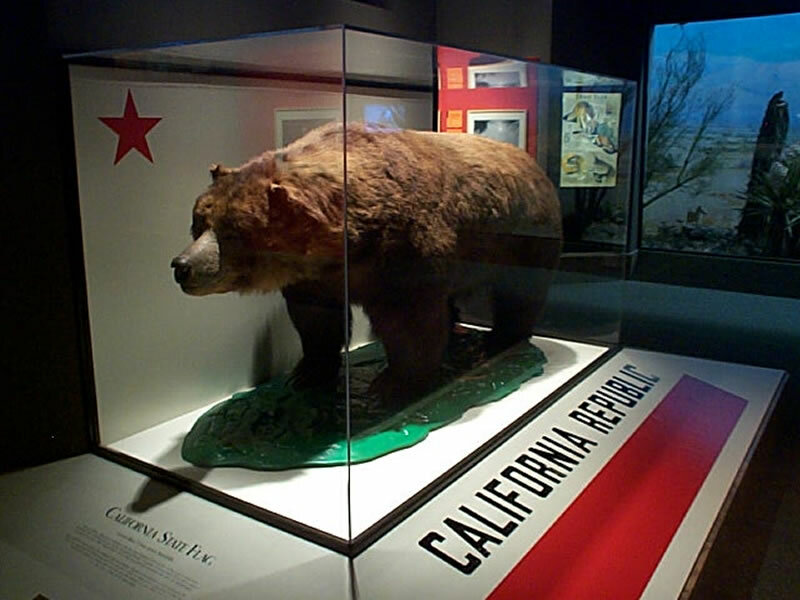 Monarch, upon his death in 1911, was mounted and kept in the Academy of Sciences in Golden State Park.